Interview topics included psoriatic arthritis, juvenile arthritis, ankylosing spondylitis, rheumatoid arthritis, giant cell arteritis, lupus, research, patient engagement in research and health care, evolution of rheumatology care, medication adherence, personalized and precision medicine, models of care, exercise, self-care, nutrition, education and pregnancy, among other important topics. 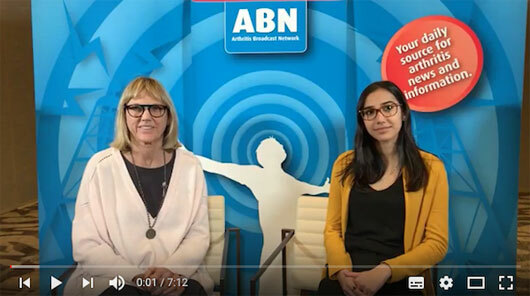 A reminder that the interviews remain on the ABN Facebook Page and are available on the ABN YouTube channel under “#CRArthritis Facebook and Twitter Live 2018”. Please continue to share, like, and comment on the interviews to continue the conversation online. On behalf of Arthritis Consumer Experts and its #CRArthritis collaborators, the Canadian Spondylitis Association, and the Arthritis Patient Advisory Board of Arthritis Research Canada, thank you again for your participation in this year’s event. The #CRArthritis broadcast booth will see you again next year!